We begin in starting childhood lessons, early so we start teaching our toddlers responsibility through chores. These are age-appropriate toddler chores to learn about responsibility and be included in your daily activities. I love teaching my daughter to have a sense of responsibility and that to be a productive member of the family means that she has to get involved. At two years old, I started S on some basic chores. It’s my hope that she’ll be a productive member of the family, especially in her teenage years. And, I choose to believe instilling these values early will help her to be a productive member of society as an adult. In order to teach responsibility (and to teach my children I’m not a slave), I chose to start chores early. Apparently, children benefit from having chores in more ways than I even thought. So, why not start early, right? 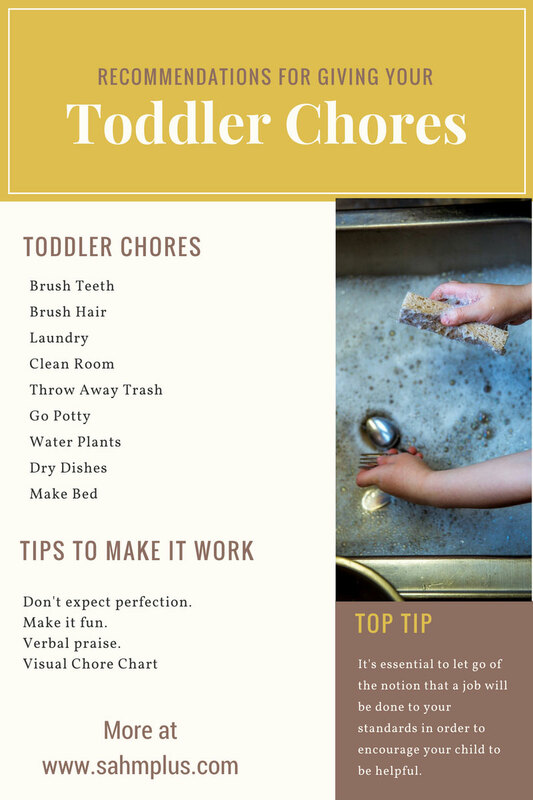 Interested in giving your toddler chores? I have a few suggestions! Brush Teeth – Good oral hygiene should start early. I typically brush my daughter’s teeth for her and then let her “finish” while I brush my teeth. While I don’t recommend this as a “chore” for older children, it’s not a bad routine to start with the little ones. Brush Hair – Depending on age, this could be scary. I let my daughter “brush” her hair and then I re-do it for her to get out the knots she makes. Again, you’re simply trying to teach your child to take care of himself/herself. Load Washer or Dryer – If you have two front loading machines, your child can put dirty clothes in the wash and clean clothes in to dry. We have a top loading washer, so it’s not really practical for her to put clothes in to wash. 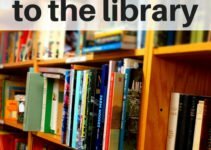 Put away toys and books – Straightening up her playroom and bookshelf gives my daughter a sense of accomplishment and helps me spend less time doing it when she goes to bed. Throw away trash – Less of a chore than a task throughout the day to stay clean. My daughter understands the difference between trash and something we keep and we’re less likely to have things she wants end up in the garbage unexpectedly. Going potty – If you’re toilet training, make this a “chore” so that there’s an added incentive to complete the task(s) for rewards. Water plants – If you’ve never tried this, I highly recommend starting with outdoor plants because most of the water will end up on the ground. I purchased a small watering can “toy” from the dollar store as it was the perfect size for my daughter, just to make things a little easier (and wasted less water in one spot). Help sort laundry – Show your toddler how to sort and match clothes. Help fold laundry – Take the time to show your toddler how to fold and let them try. (Yes, you’ll likely be re-doing it, but they’ll get a sense of accomplishment from the task). Put clothes in hamper – This is so simple … just having your toddler put their own clothes in the hamper will make them smile. Make bed – Well, you know you have to help, but you can show them how to pull the covers up and toss the pillow(s) on the bed. Dry dishes – While you’re washing dishes, or removing them from the dishwasher, hand the unbreakable items to your tot to towel dry. Don’t expect perfection. Surely you know that. But really, expect that you’re going to be re-doing chores to your standards for a while. But, when your five year old can sort, fold, and put away her own laundry, you’re going to be so proud. Not to mention, you’re seriously going to feel great being able to delegate chores and reduce your own work load!! Make it fun. Turn on Pandora. Sing and dance. Or make a game out of the chores. Basically, don’t stress it and let your kid enjoy the tasks instead of making it feel like a chore. Have a visual chore chart. Kids love seeing their progress. 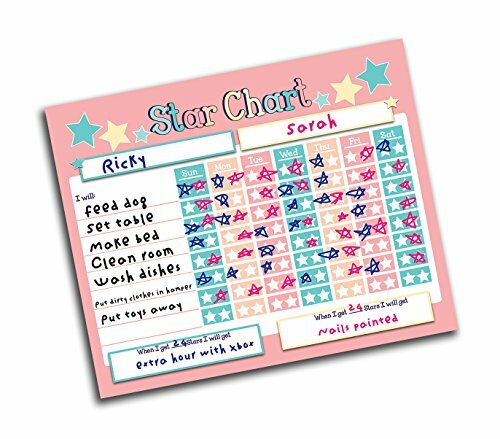 Either make your own toddler chore chart or buy a really cute one. We really love our Melissa & Doug Magnetic Responsibility Chart. Verbal Praise. 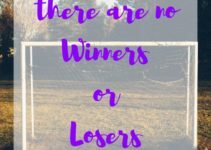 Let your little one know what a good job they did and how much you appreciate their help will further enhance their natural desire to help. What other toddler chores do you recommend? Great tips! 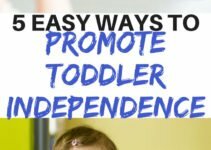 I totally agree that these are all totally doable by a toddler, and I highly recommend.